Touring around Australia can be so much fun. Whether you are rolling with your caravan or travelling in a group with motorcycles, you will definitely enjoy all the fantastic landscapes, beautiful sceneries, and other landmarks along the way. Some of these landmarks are the big icons of different towns and cities. They are built to represent the place’s main product or important event in its history, and also as tourist attractions. If you want to visit some these on your next tour, we listed the five best big icons in Australia for you. About five hours drive from both Sydney and Brisbane via Pacific Highway, Coffs Harbour in New South Wales is home to The Big Banana Fun Park. In front of the park is the biggest and oldest banana statue you can find, which measures more than 13 metres in length and 5 metres in height. Back in 1964, it was named one of the most famous ‘Big Things’ in Australia. Today, the Big Banana is one of the most photographed landmarks in the country. If you are driving towards Sunshine Coast from Brisbane, why not make a short detour to Woombye and see the iconic Big Pineapple. This 16-metre tall structure was created in 1971 and was listed in the Queensland Heritage Register back in 2009. It is situated at the front of a 165-hectare site that also hosts a pineapple plantation, plantation train, and Wildlife Sanctuary. The Big Pineapple is made from fiberglass and has two floors inside and a viewing platform, which tourists can access. The second floor has some old pictures of the plantation on display and products for sale. One of Australia’s five best big icons is Ballina’s ‘The Big Prawn’. Placed on top of a souvenir shop and a seafood restaurant, this replica of a huge crustacean represents the seafood market of Ballina. It measures 9 metres x 6 metres and weighs about 35 tonnes. It was created in 1989 but has undergone a reconstruction and was opened again in 2013. The Big Prawn is just less than 2 hours away from Gold Coast. A must-do quick stop if you are driving from Brisbane to Sydney. 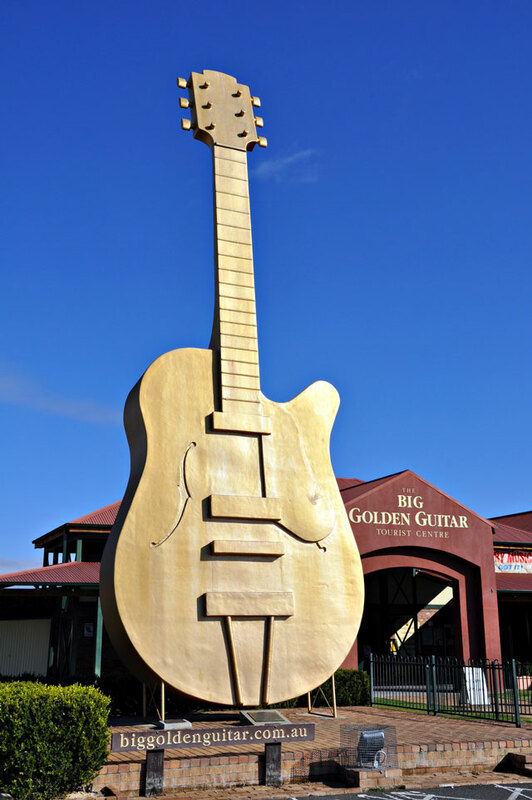 Tamworth is Australia’s country music capital so it’s not surprising that you will find the Big Golden Guitar here. This 12-metre high statue was unveiled in 1988 by Slim Dusty, the King of Country Music in Australia. You can see the Big Golden Guitar outside the tourist information centre of Tamworth, which is just five hours away from Sydney via New England Highway. This giant statue named ‘Arnold’ represents the most popular fish of the Murray River in Swan Hill, Victoria. It is placed just outside of the town’s railway station and measures 11 metres x 6 metres. The big Murray Cod’s existence also has an interesting story. It was actually first built as a prop for the 1990’s movie Eight Ball, which is about tourism. After the film wrapped up, the people of Swan Hill adopted Arnold and the rest is history. Swan Hill is about a 4-hour drive from Melbourne and more than 5 hours from Adelaide. Next time you make a tour around Queensland and New South Wales, make sure to stop at these locations for pictures to show to your family and friends. Just stop by at these five best big icons in Australia and you will have a more exciting trip.